Already eaten your five a day? This fruits here don't count, but they look just as juicy as real fruits. Which girl wouldn't skip dessert for a few weeks, to get her hands on one of those beauties instead? These are the latest fruit shoes and you have the choice between strawberry, apple, melon or pineapple. All of them cause an immediate summer feeling, no matter what the weather forecast says. My dream shoes are the melon high heels from Office. I eat berries and bananas most of the time, but in fashion the melon is my absolute favourite fruit. The design of this shoes reminds me a little bit of Charlotte Olympia. I wish I had them in my shoe collection and imagine how beautiful they would look with all my summer dresses. Who needs Cinderella shoes, if you can be Melon-ella instead? Please my dear prince, you don't have to bring diamonds, bring fruit shoes instead! 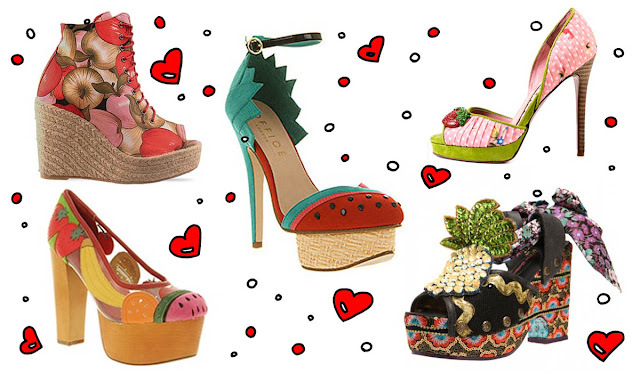 Which one of these shoes is your favourite and do you already have fruit shoes? Those pink strawberry shoes are completely adorable! You can go on the web and discover the data on the majority Havaianas rose gold of the most recent patterns that you can appreciate with new shoe design.